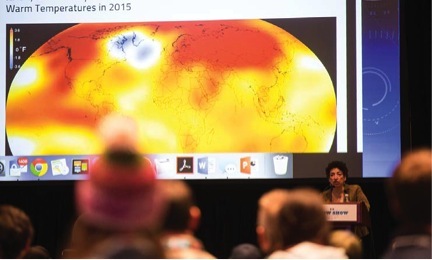 Dr. Naomi Oreskes encourages industry to keep fighting. Read the digital upload of this print story in SSD Day 3. “She’s 5 foot, 3 inches tall with a combative, warrior mentality,” Aspen Skiing Company vice president of sustainability and Protect Our Winters board chairman Auden Schendler said when he introduced Dr. Naomi Oreskes at Friday’s Burritos and Bloodies Breakfast. Keynote speaker and POW board member Oreskes is also a history of science professor at Harvard University. And Schendler wasn’t exaggerating. Oreskes has thrown a relentless spear into the contentious battle over climate change for more than a decade. In 2004, she picked apart the existing research to confirm whether effective papers that discounted climate change actually existed. They didn’t — which sparked angry emails in response and even death threats. Her research— presented in her best-selling book and feature film, “Merchants of Doubt” — uncovered a strategy of disinformation engaged by the fossil-fuel industry to confuse the public about the science behind climate change. (The tobacco industry used the same tactics of doubt when it covered up the health effects of cigarettes.) Now what? The linchpin of progressive change is policies related to renewable energies and getting those efforts deployed on a large scale. To drive home the point, Oreskes pulled up graphics of the U.S. from 1984 to 2015. The regions with the most solar PVs installed weren’t based on variables like sunlight exposure or a community’s social makeup. Instead, installations were highest where policies were in place. Here’s the good news: Renewable energy technology exists and is aff ordable. The cost of solar has dropped dramatically —from $77 per watt in 1977 to $0.36 per watt in 2014— and solar is the cheapest new energy in 60 countries. In 2015, renewables (led by wind and solar) represented more than half the new power capacity around the world, reaching a record 153 gigawatts (GW), 15 percent more than the previous year, according to the International Energy Agency. “As climate activists, we haven’t been clear about what we’re in favor of, what can and is being done, but we need to pick up the pace,” said Oreskes, emphasizing that litigation about the science of climate change shouldn’t be the focus of the conversation. President Trump aside, take one look at the past 40 years of U.S. Congress voting trends — made visible by the Environmental Voting Score released by the League of Conservation Voters — and it’s clear that since 1990, Republicans in Congress have turned starkly away from supporting the environment. Activists and snow sports industry players, here’s what you can do: Set up a five-minute meeting with your local state representatives to share your stance on climate change policies. Present them the research on the number of outdoor industry jobs vs. oil and gas industry jobs in your state. Be patient when you find yourself in divided chairlift conversations. Change doesn’t happen overnight — but we can’t do nothing. “Everyone needs to speak up,” Schendler said. “We need to get those positive messages out.” We need to collectively fight a meaningful battle that’s bigger than our day-to-day tasks.